This week it has been all over the news that Waitrose is pledging to ban plastic glitter or look to use biodegradable alternatives. It’s great to see that major retailers are taking steps to reduce their plastic footprint and we want to see more of it. We are in talks now with a number of retailers, looking to encourage them to consider Bioglitter as an alternative to plastic glitter. In fact, we’ll have some news to announce with that soon, as we’ve been working with suppliers to Marks and Spencer, on trials to replace plastic glitter with Bioglitter. 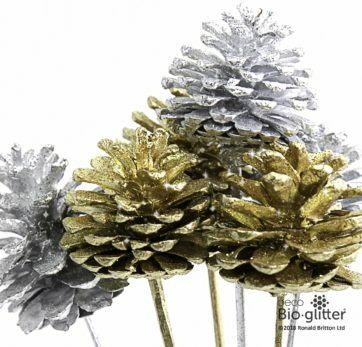 The trials are in place now using our new Deco Bioglitter, a naturally degradable, plant based glitter designed for the coatings and decorative market. The product uses the same technology as our beauty glitter, Bioglitter Sparkle, but has been developed specifically for this sector, so for use on everything from cards, flowers, packaging, even for use in interiors and the fabrics/fashion industry. It’s our hope that more retailers and suppliers to retailers will come on board to replace plastic based glitter with the new Deco Bioglitter range. Below are some links to stories on the work of Waitrose and Marks and Spencer to cut plastic/glitter waste, including a mention of, you guessed it, Bioglitter, in the Grocer and a reference to our work with Marks and Spencer in the Guardian.